It’s true, having friends help widen one’s horizons. Someone proposes a crazy idea, another acts on it and then you find yourself being swept along. Buoyed, raised, pushed beyond your boundaries. It’s really good to have friends. 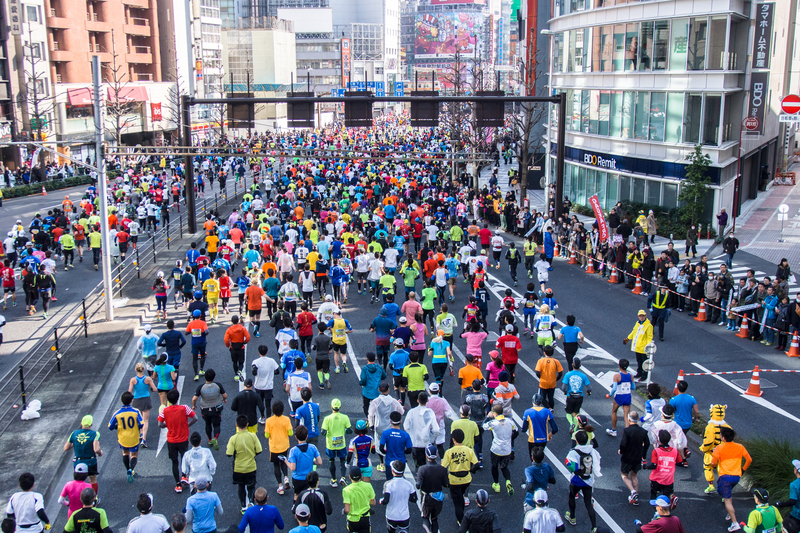 I’d never have run a marathon, if not for friends. Much less going out of the country to run one. 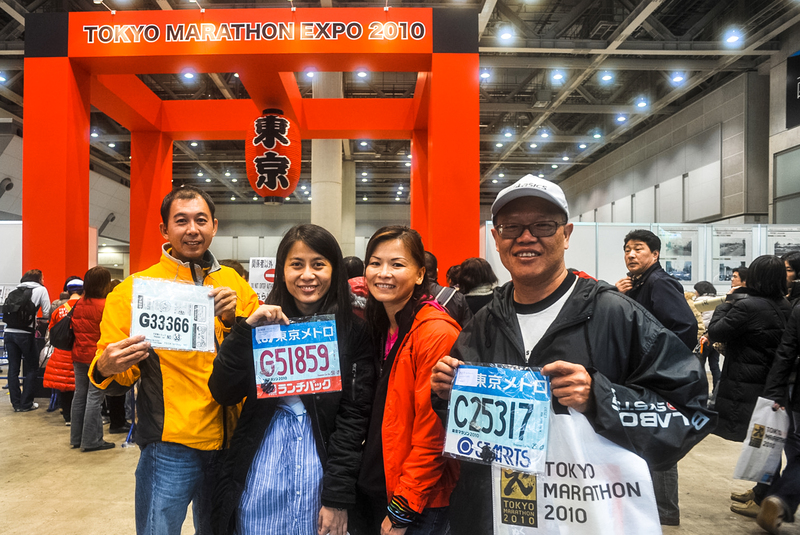 Those same friends, bored of running in Singapore, decided to explore overseas options. KL, Ipoh, Hong Kong, Tokyo. 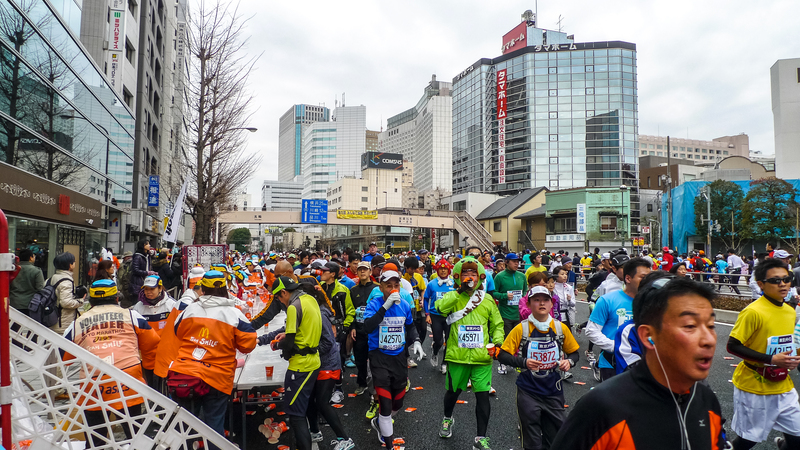 Bored of marathons, they moved on to ultra trail marathons (50km, 100km, 170km). I’m more level-headed so while they are still running, I have taken to reminiscing. 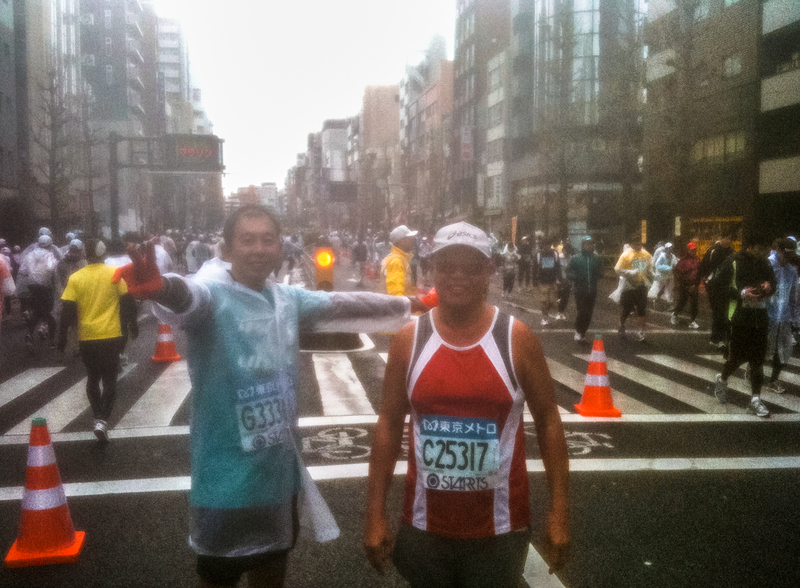 The best marathon I had was in Tokyo. 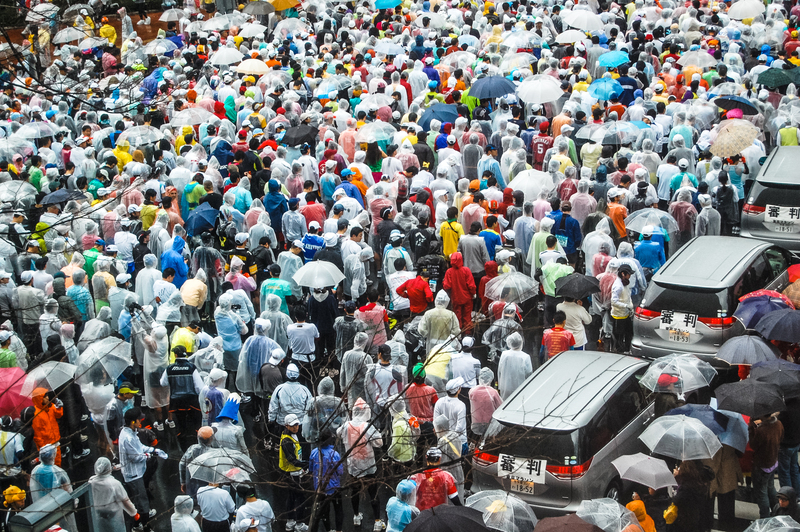 The scale of the logistics, the size of the crowd who had gathered to cheer and the high energy levels, so impressed us. I didn’t follow when they went in 2009. 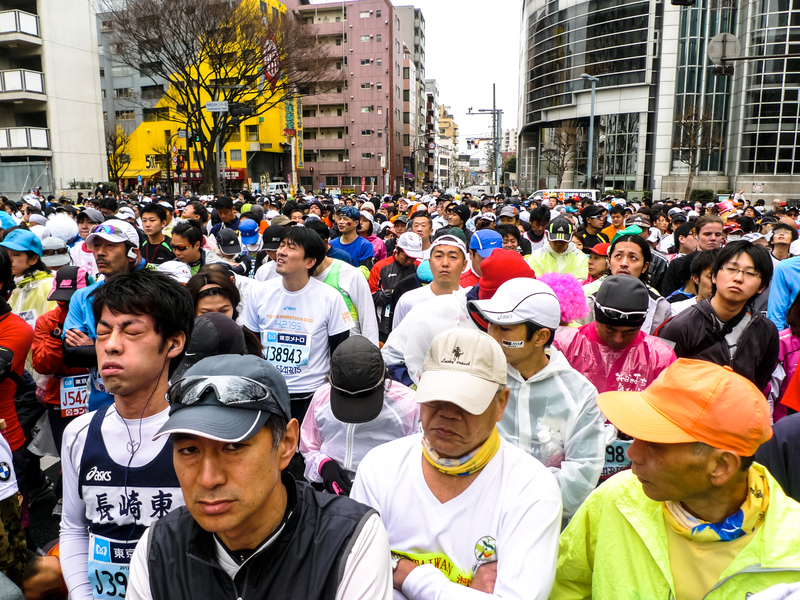 I only wanted to run a half marathon but Tokyo didn’t have such an option (only 10km or 42km). 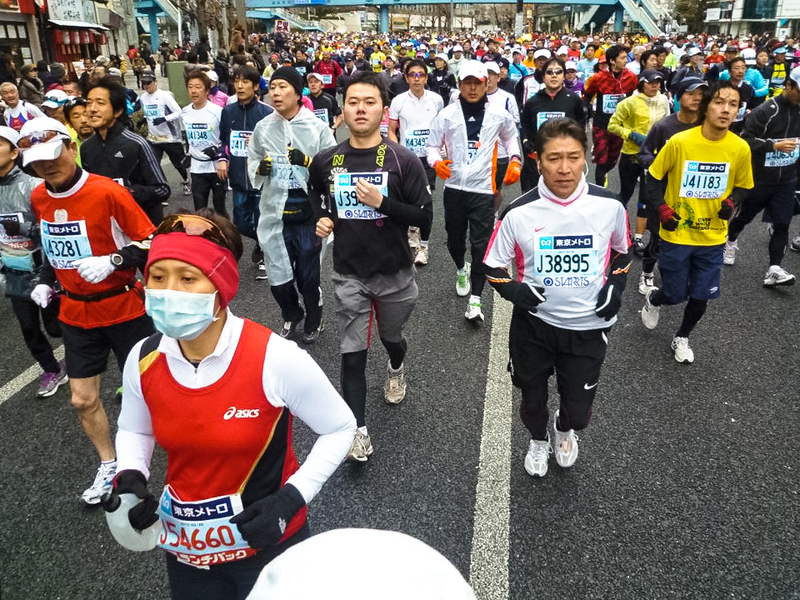 Because, training for a marathon was too hard – it was 10x worse than the actual thing itself. 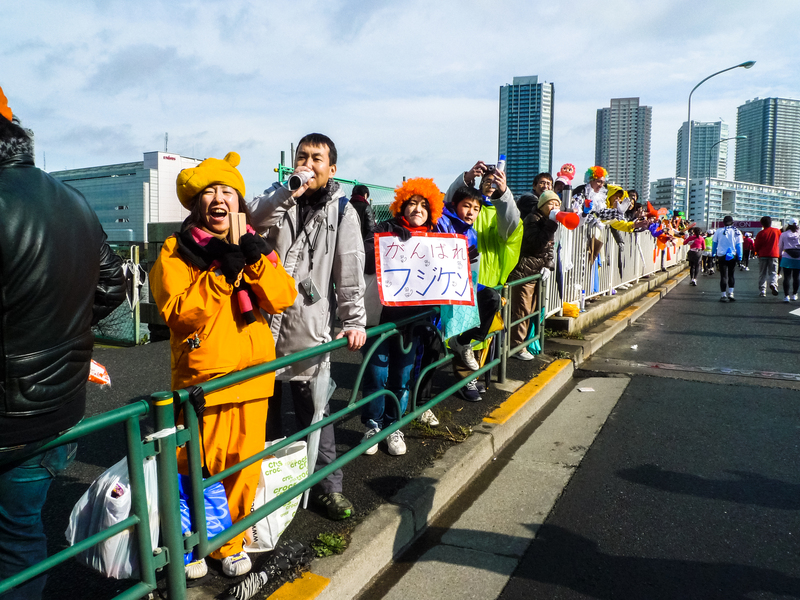 However, their exuberant report piqued my interest: so many supporters, so much food, so much drinks that they couldn’t see the road. Really? Then I needed to go check it out myself. 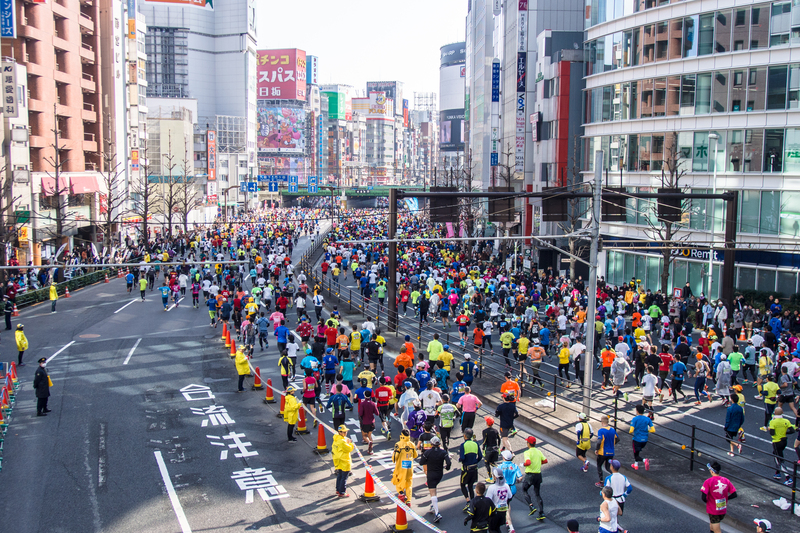 That year, application for a place to run was oversubscribed by 8.5x. But we were lucky. All of us got it. 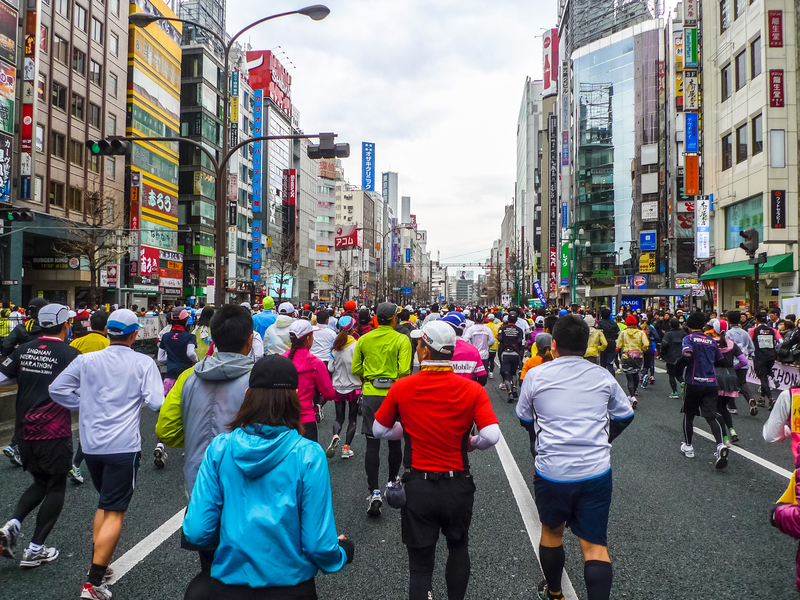 The Tokyo Marathon is always held on the last sunday of February. And it has been known to rain at every previous edition. Our’s was no exception. 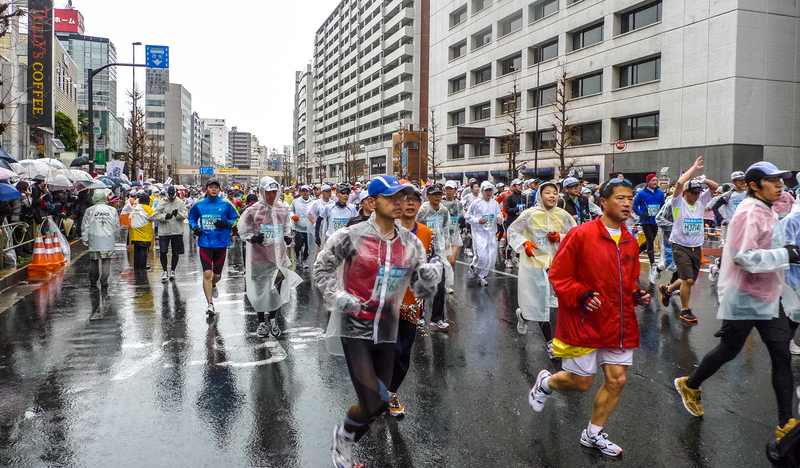 At 4 degrees under a long-lived drizzle, it was the wetness than brought chills to our bones. Yet, the turnout was spectacular. 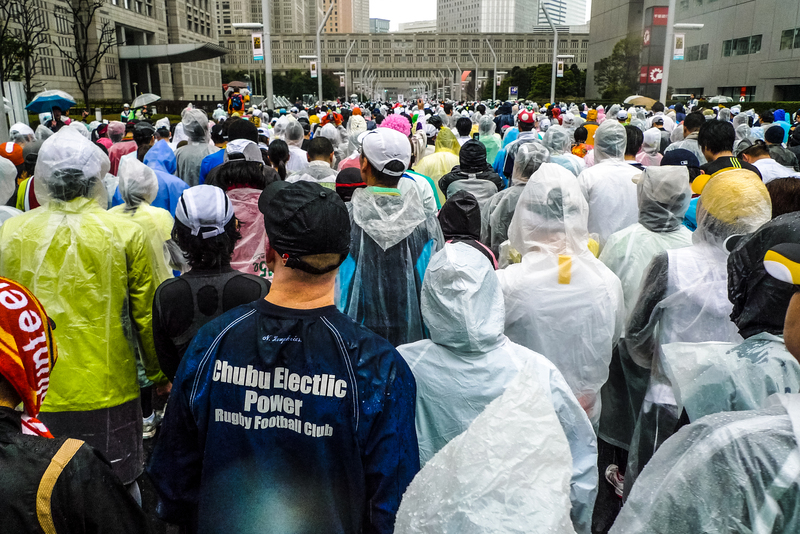 Supporters lined up the streets in thick down jackets, hoisting umbrellas, braving the rain and cold to cheer runners on. 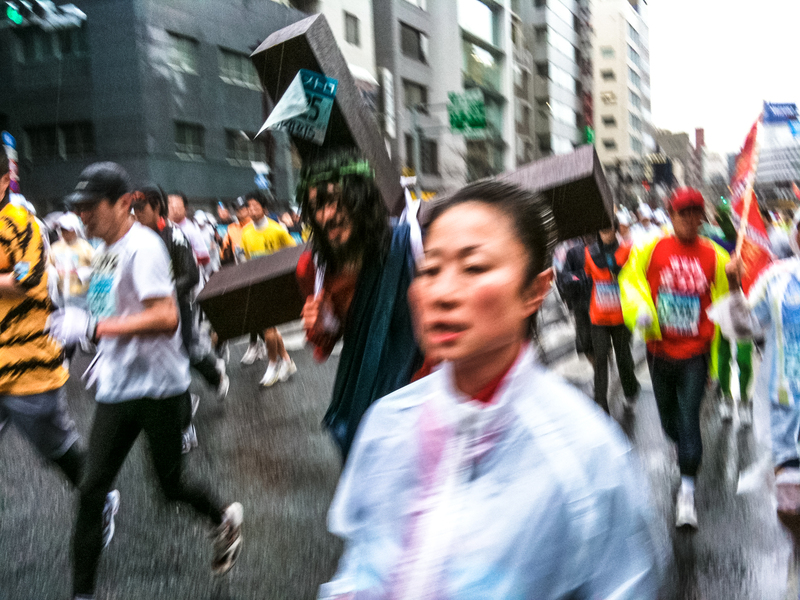 That certainly defied logic more than those runners did. 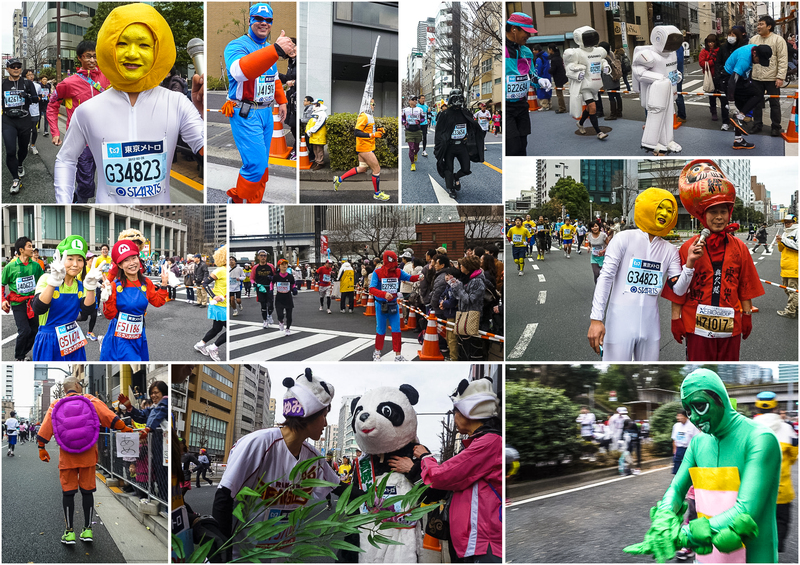 Lots of runners donned costumes for the run. 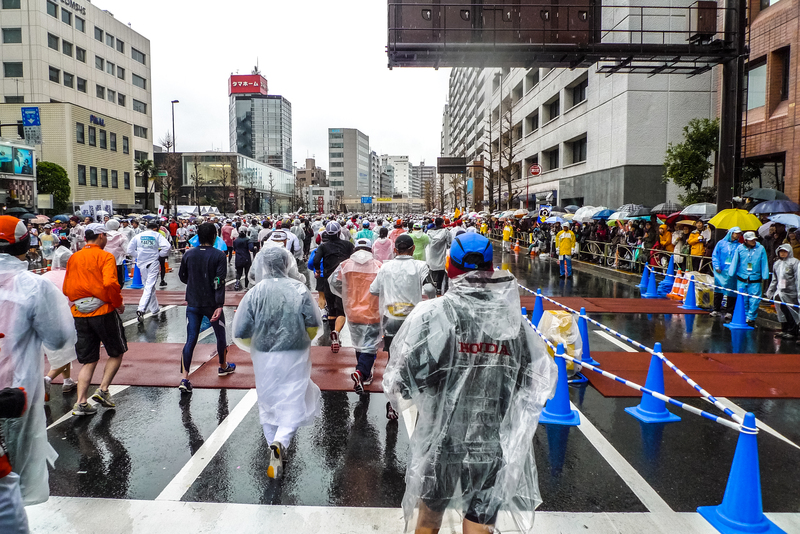 In spite of the rain, there was an amazing carnival-like atmosphere throughout the run. 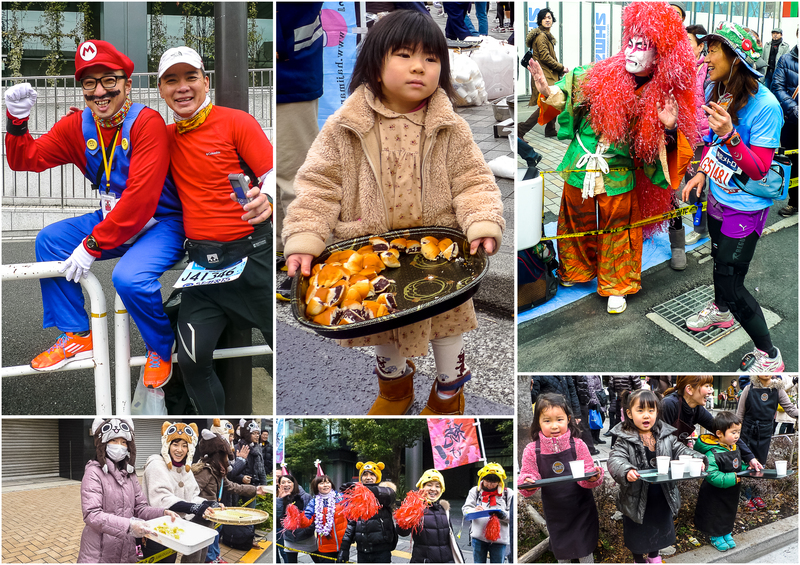 Performers were stationed at strategic locations to lift the morale of runners. But the best part was the supporters. It was as my mates claimed: not a single empty space along the route could be found. 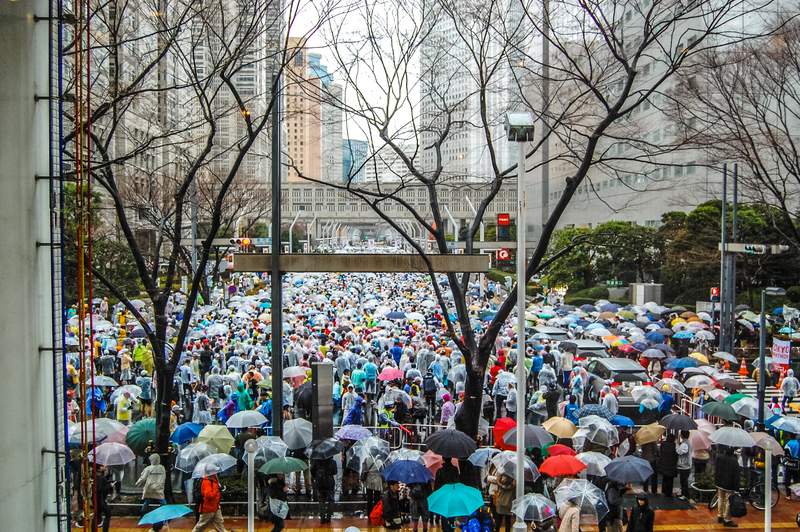 The pavements were packed with friends, family, colleagues cheering away. And our SG supporters were amongst them (yes, I saw you guys!). 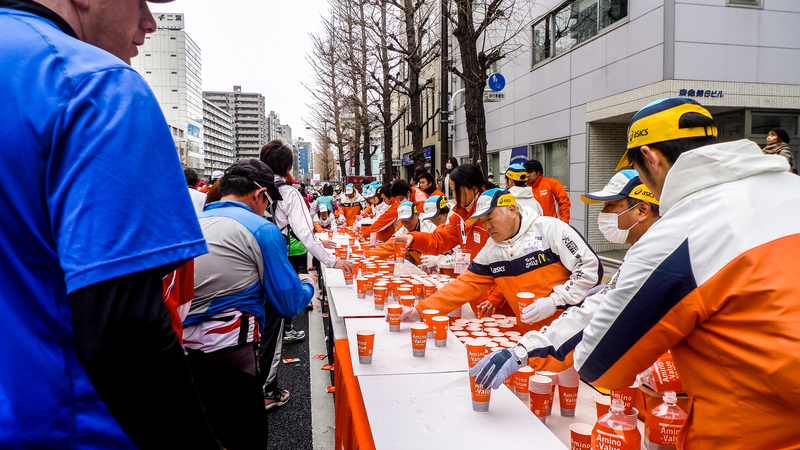 The cut-off time was 7 hours and there’s a checkpoint at every 5km mark with a huge sign-clock indicating the cut-off and current times. 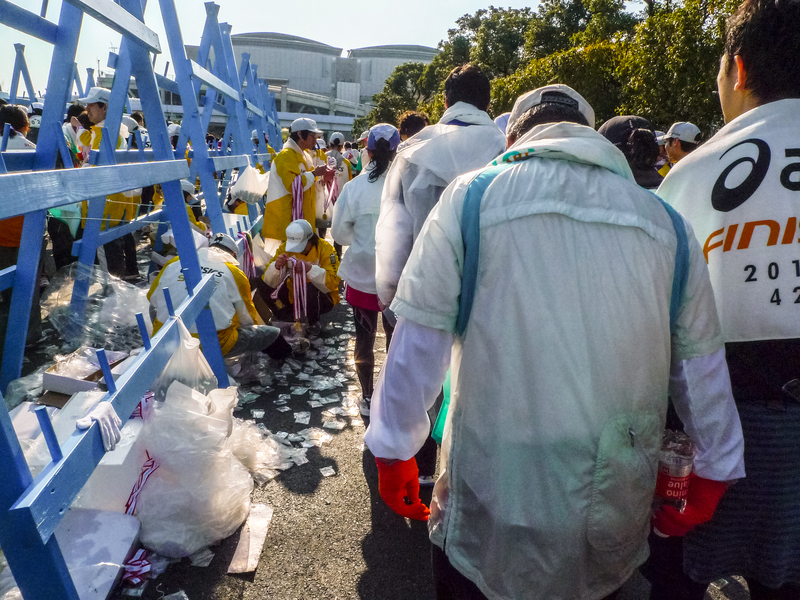 Once the checkpoint closed, runners would be hauled up the sweeper bus. I was a bit worried that I would get asked to get up too but thank goodness I made it back in 5.5 hours. 2 years later, I was back. Submitted my name on a whim not expecting to be selected but I got it. 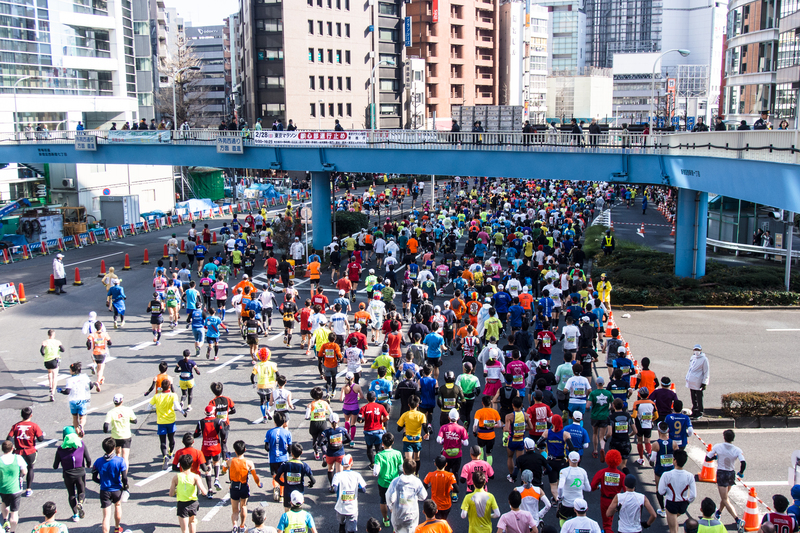 This time, the marathon was 9.6x oversubscribed. 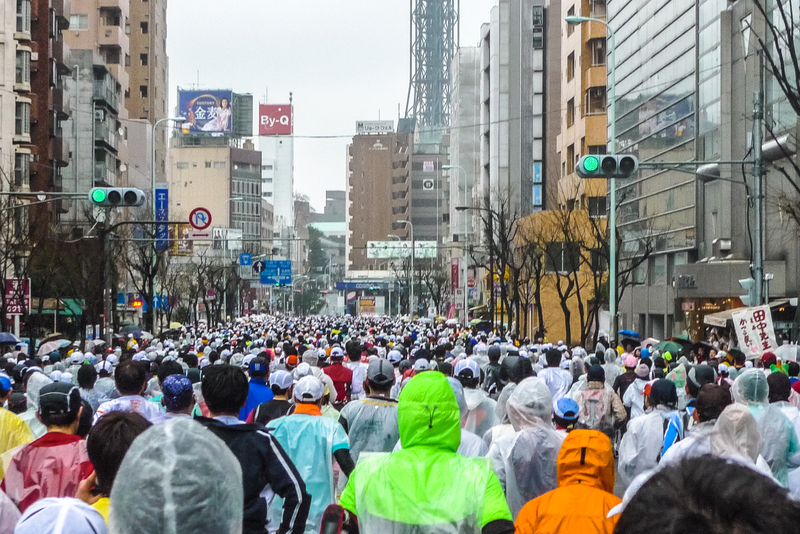 The weather was perfect that year – 5 degrees, slightly overcast, no rain. 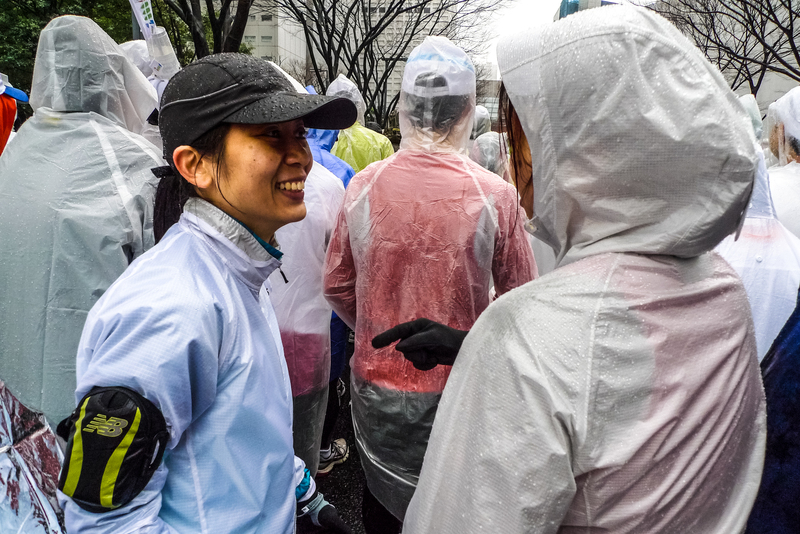 We took the opportunity to record candid shots of runner and runspirators. The route was exactly the same as in 2010. 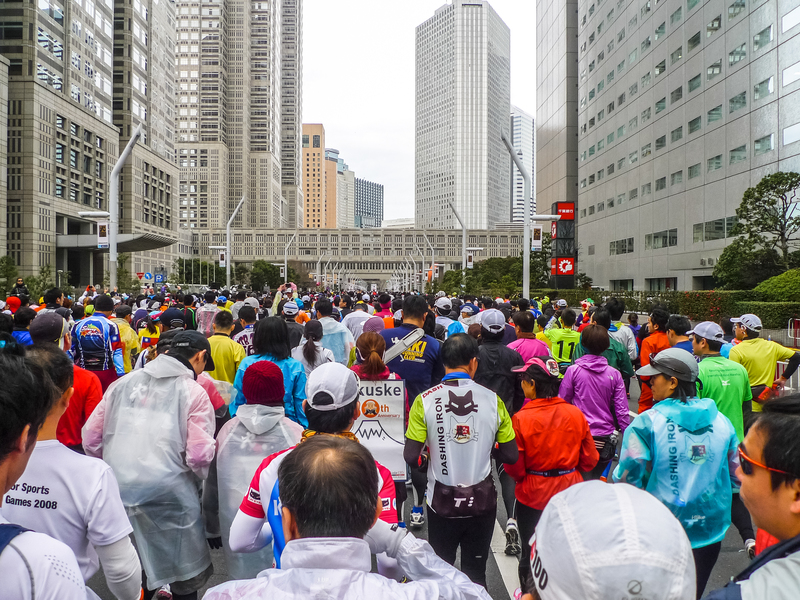 We started from Shinjuku, in front of the Tokyo Metropolitan Government Building, just before the link bridge. 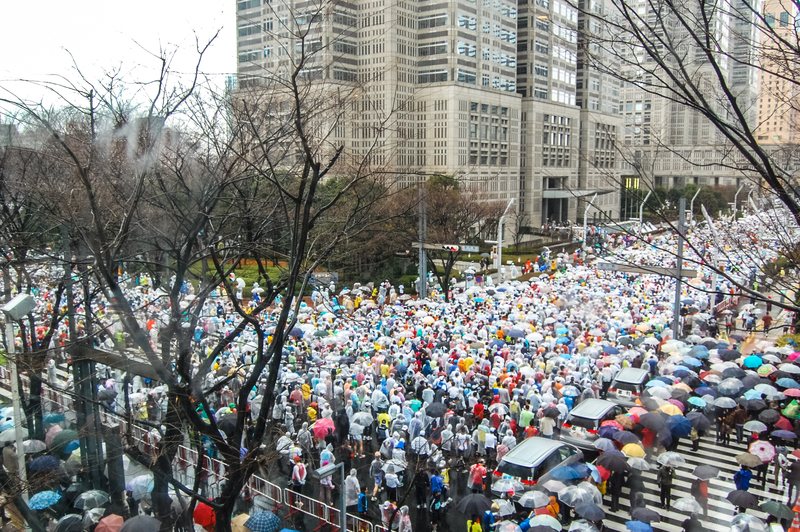 Then we moved towards Iidabashi, turned south towards the imperial gardens. From the imperial gardens, it was all the way down to Shinagawa JR station, then we u-turned back to Ginza, running by Tokyo Station & Nihonbashi and then it was all the way up north to Asakusa. 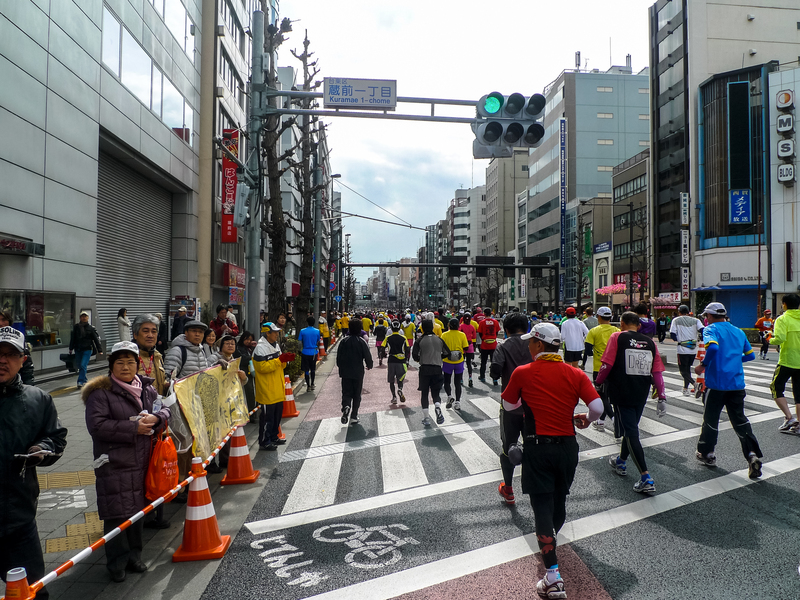 We looped back from Asakusa back to Ginza, for the final 7km to Odaiba and the final destination, Tokyo Big Sight. 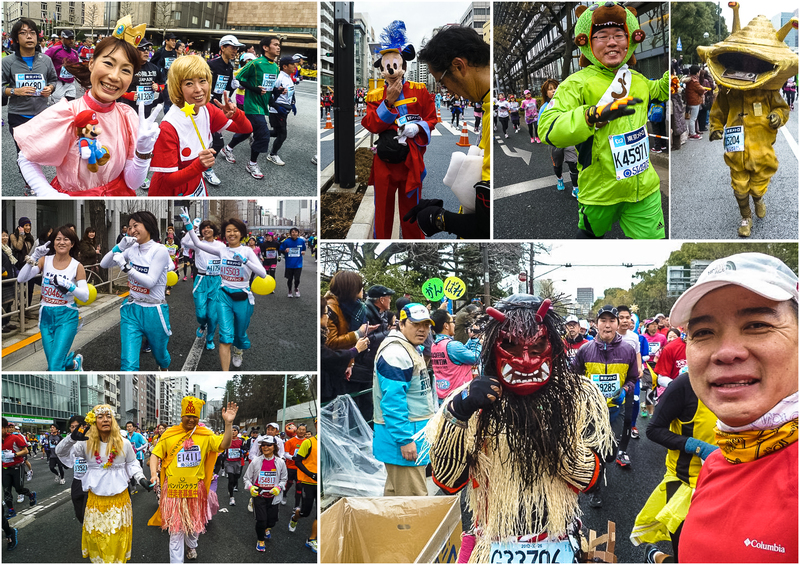 There were no lack of costumed runners. We saw spiderman, spacemen, turtleman, pandaman, even Mickey. 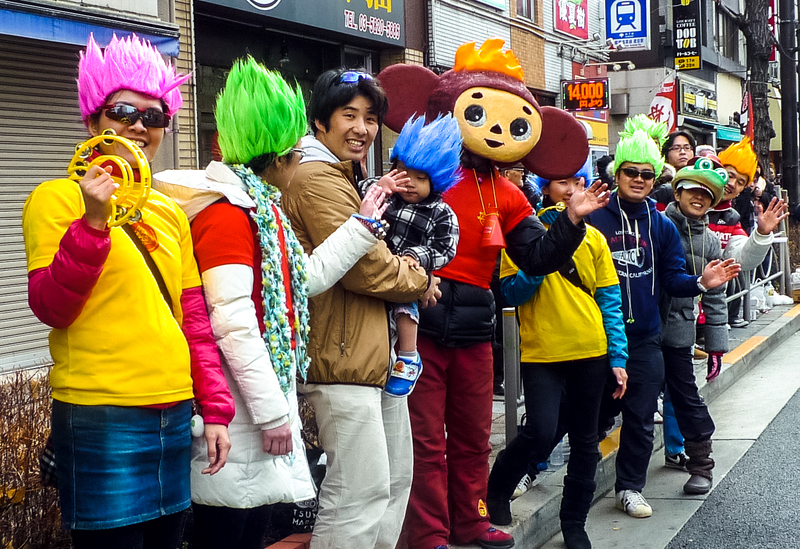 Though they were all dressed up and some were obviously burdened by their costumes, they could still run faster than me! I also saw ‘Salary Man’ running in his working suit, a briefcase in his right hand, in immaculately polished patent shoes. How did he manage to last all the way with those shoes was what kept me wondering all the way to the end. This time I took 6 hours so I had the fortune/misfortunate of having a close encounter with the sweeper bus. 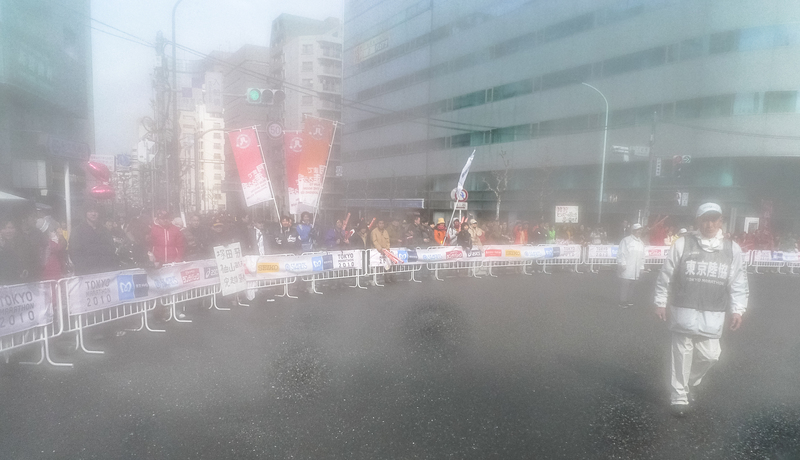 There it was, on the opposite lane moving slowly, deliberately behind the last runner. Right after the sweeper bus was the cleaning truck and behind the cleaning truck came the traffice police/volunteers removing the road blocks. 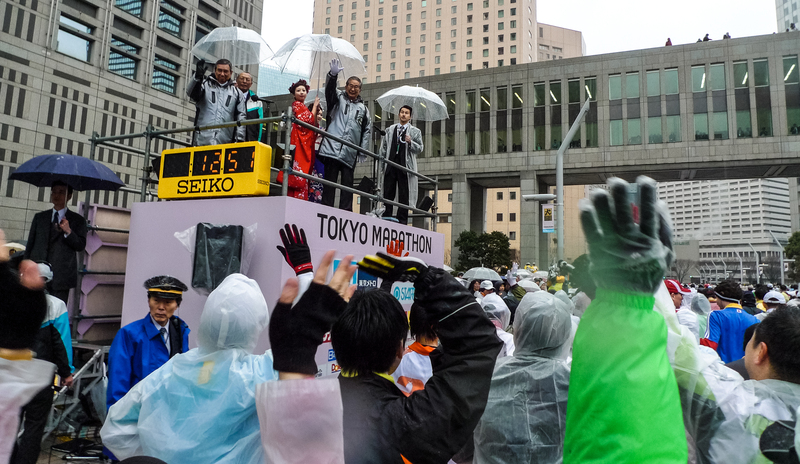 That’s how they could reopen the roads right after the Marathon. 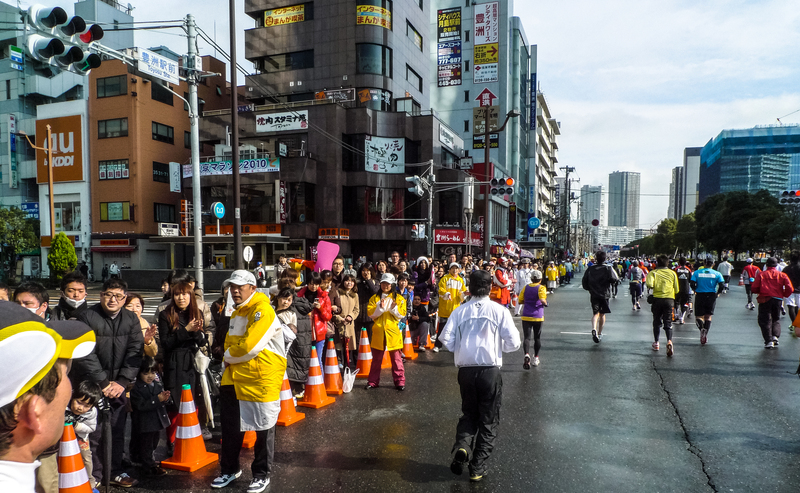 Last year, I was in Tokyo in late February so I went to watch the Marathon just as it started. 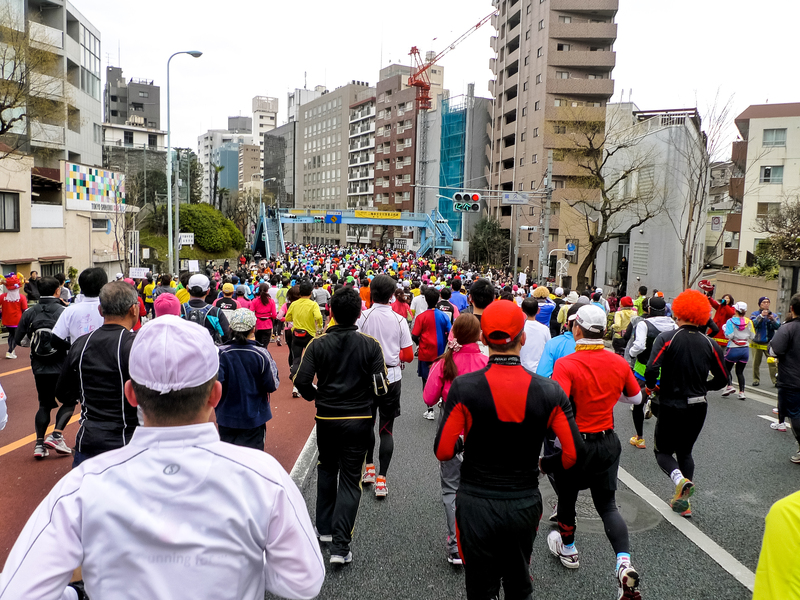 It wasn’t as fun compared to running it with friends but it was still a grand sight. The weather was great, cold but sunny. Here are the shots taken from a bridge I’d seen during my earlier runs. 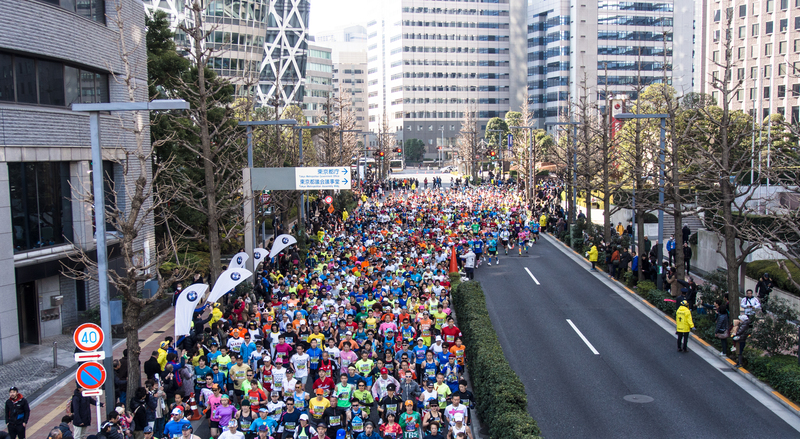 These days, it is exceedingly difficult to get a slot at the Tokyo Marathon. 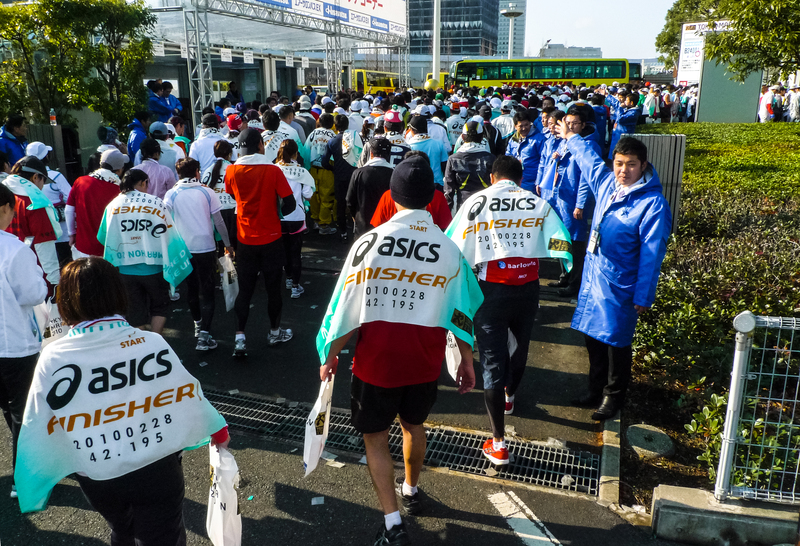 Demand outstrips supply by 12 times and the maximum number of runners is capped at 35k. Lucky us, we went for it years back.